I am very pleased to announce that all four sessions on J.R.R. 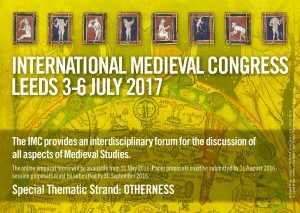 Tolkien I proposed for the International Medieval Congress at Leeds 2017 have been accepted! This will be the third consecutive year of papers on J.R.R. Tolkien at IMC Leeds, after a successful series of sessions in 2015 and 2016. Leeds is, indeed, a Tolkien-related location, and it is very fitting that his work will be explored in this prestigious conference. I am looking forward to a series of brilliant sessions and papers from well-established Tolkien scholars, alongside new voices and perspectives! This session will address aspects of Tolkien’s medievalism. Yvette Kisor examines the frequent use of the word ‘knight’ in Tolkien’s translation of Beowulf, especially to translate a range of Old English terms. Anahit Behrooz addresses the complexities of orality and frame narratives in the earliest version of Tolkien’s mythology, The Book of Lost Tales. Anahit Behrooz addresses Tolkien’s cartography as a liminal space between medieval mapmaking and modern practices. Aurélie Brémont discusses the transformations of the Corrigan, from Breton folklore to Tolkien’s The Lay of Aotrou and Itroun. Victoria Holtz-Wodzak considers the ways in which medieval Franciscan theology shaped Tolkien’s portrayal of the natural world. This session will focus on ‘new’ works by J. R. R. Tolkien: creative works published posthumously during the last few years. Participants will examine all or a selection of the following works: The Legend of Sigurd and Gudrún (2009), The Fall of Arthur (2013), The Story of Kullervo (2015), A Secret Vice (2016) and The Lay of Aotrou and Itroun (2016). Verlyn Flieger will examine the complex ways in which Tolkien’s creative adaptation of medieval literature shaped some of his best-known fictional characters. Brad Eden will focus on Tolkien’s use of the liminal forest in terms of setting, language and characterization. Kristine Larsen will concentrate on medieval lunar symbolism in the representation of female characters, and Andrew Higgins will explore the use of the Indo-European model and Tolkien’s expertise in philology in the development of Tolkien’s invented languages. Tolkien’s legendarium has often been approached by scholarship via the lens of medievalism. Scholars have been long interested in Tolkien’s medieval intertexts (e.g. Old and Middle English works such as Beowulf and Sir Gawain and the Green Knight) and such studies have established a clear view of Middle-earth as a world that engages with the heroic code, material culture, philosophical, and theological concepts, as well as fantastical beings, from the literature of the European Middle Ages. However, a more recent trend is to examine Tolkien’s work in terms of its engagement with the cultural moment(s) it was created, spanning six decades of literary and cultural history. Where is Tolkien scholarship heading? Should we move away from ‘Tolkien the medievalist’ and focus more on Tolkien as 20th-century author? And what about recent developments in literary theory? This round table discussion will debate the complexities of such questions and will interrogate scholarly practices and expectations in Tolkien Studies. This session explores various aspects of the construction and role of the ‘other’ in J.R.R. Tolkien’s medievalism. Irina Metzler surveys the representation of disability in Tolkien’s mythology and its medieval analogies and constructions. Thomas Honegger focuses on Tolkien’s critique of chivalry in his medieval scholarship but also in his construction of the ‘other’ Middle Ages in his creative work. Sara Brown addresses an important figure of medieval literature and legend, the Dwarf, focusing on the ‘othering’ of female Dwarves by their very absence. Gaëlle Abaléa interrogates the world of the Dead as ‘other’ in Tolkien’s legendarium, examining its boundaries, and its relation to Faerie.